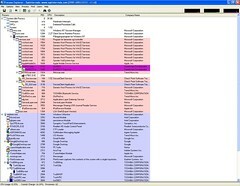 At a technical seminar, I was introduced to the magic of Process Explorer, a tool developed by SysInternals (now a Microsoft-owned company), which picks up where the taskmanager leaves off. Found here, it is contained within a 1.5 MB zip-file, and it runs without installation. At a glance, I am very simply put impressed. It is an intuitive and very strong tool, and it works admirably.